Multiscale modeling is a very descriptive name. It refers to modeling a component or a system at different scales simultaneously so you get information at minute scales without the necessary cost of modeling everything at a fine resolution. Well, what does that mean? Imagine a part that is made of woven composite material as typical in portions of airplane fuselage or wings, race cars chassis, wind turbines, or sporting goods. In analyzing the full system for structural performance, to what extent is the composite part modeled? As you can see in the image below, there are multiple scales at which the composite part can be represented going down from a simple laminate all the way to its constituents. The smaller the scale of modeling, the more detailed information is available for proper assessment, but it comes at a steep cost to capture at that scale for a large system analysis – often times just not feasible computationally. Multiscale modeling enables capturing details at smaller scales efficiently and using that information to provide a better assessment of performance and failure modes of the part or system that may be modeled at a coarser level in the macro model. Some of the common materials that are analyzed this way are heterogeneous materials like composites with fibers and matrix, reinforced concrete or porous materials like bones & foam. To answer that question, let’s take a step back and look at one of the relevant trends in many industries – lightweighting. With innovation in materials, processes, shapes, parts are made lighter and stronger than ever before. It’s a continuous quest to improve traditional materials and also experiment with new materials that are a combination of multiple ones. Manufacturing methods like 3D printing, injection molding, draping introduce process dependent material properties that also need to be captured for a proper analysis. Composites and other heterogeneous materials are playing an active role in achieving lightweight targets. And in that regard material modeling remains one of the interesting challenges. 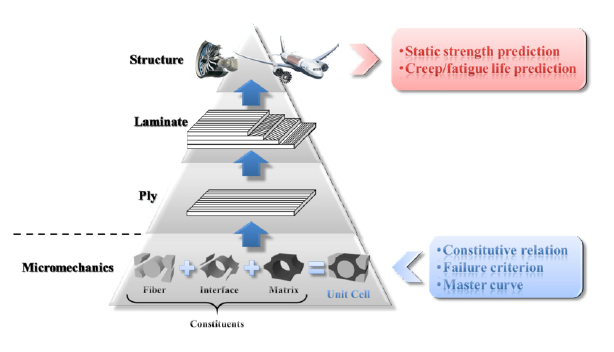 Traditional testing methods and characterization procedures applied to metals are not sufficient for heterogeneous materials like composites, as there is too much complexity coming from the microstructure, part geometry, process conditions; relying on physical testing alone is not only cost prohibitive but also makes it an infeasible option. Typical modeling is done at the laminate level (black aluminum) or somewhat better, at a ply level. However, the analysis is missing important details about what is happening at individual constituents to make a proper assessment – what are the right material properties, what is the failure mode, how are the properties modified with progressive failure at different levels? Trying to model the entire part at a smaller scale is just not feasible given the level of detail that is required at the micro level. So considering the constituent properties, any test data available for calibration, and noting the microstructure definition along with any manufacturing process condition, a multiscale technology will build up the material model that will plug into a macro analysis model with coarser resolution as schematically shown below. To have a realistic performance prediction and optimum design of these materials, modeling should consider the microstructure as well. Micromechanics approaches characterize the heterogeneous composite behavior by analyzing the constituents, and with a multiscale coupling, the material model developed on the microstructure is propagated to different scales like a macro model of the structure under investigation. There is a simple but useful explanation of micromechanics approaches on Wikipedia from which the image below is referenced. Composite properties and material information is propagated up the pyramid from micro to the macro model, whereas the stress and strain fields from macro to micro that helps studying localization of failure and damage. As with any analysis procedure, the approach taken will be a tradeoff of accuracy, speed of computation, ease of coupling with macro solvers. Multiscale Designer in HyperWorks is a perfect tool for studying and modeling heterogeneous materials and performing a multiscale analysis with a powerful combination of accuracy and efficiency. There is an excellent write up on material certification of laminated composites in our recent newsletter here. 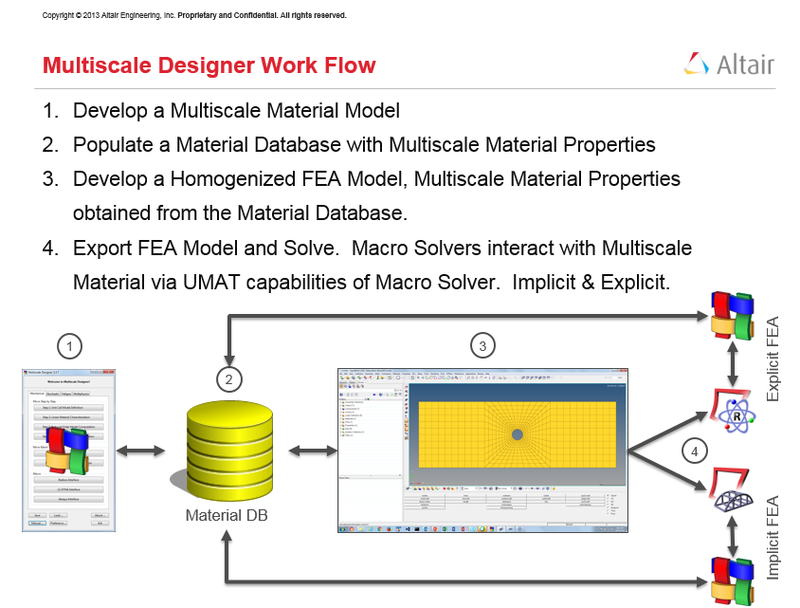 The workflow for characterizing materials and performing a multiscale analysis with Multiscale Designer is shown below. With so many types of composites (i.e. 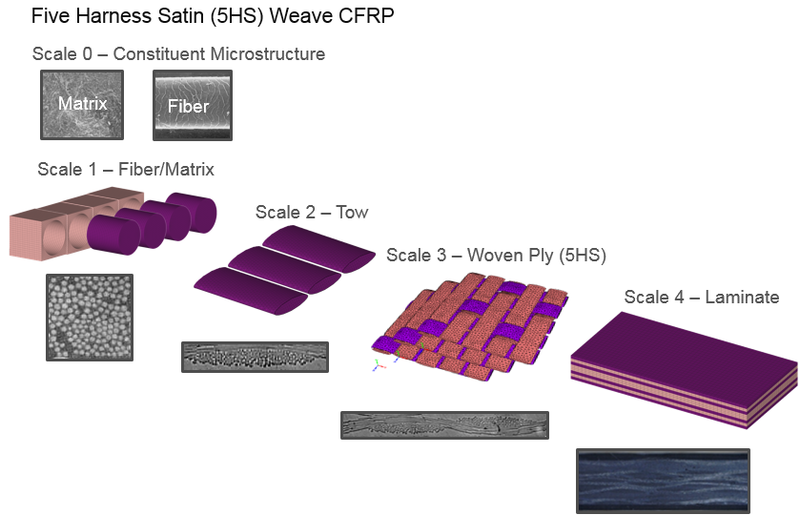 short fiber, long fiber, woven, particle reinforced, etc.) simulated in implicit and explicit macro solvers using analytical and direct methods, there is continuous development activity pushing this technology to address the needs of customers from different industries and applications. Altair Partner Alliance also offers complementary technologies in design of composite materials that couple and enhance the capabilities of macro solvers RADIOSS and OptiStruct. Interested in learning more? View the webinar on multiscale analysis with Multiscale Designer here.